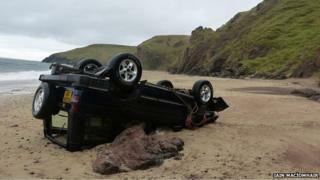 Image caption An Land Rover a bh' air bristeadh sìos air an tràigh 's a chaidh a thoirt a-mach air an làn. Bha iomairt mhòr theasairginn ann an ceann a tuath Leòdhais an dèidh mar a chaidh Land Rover fhaicinn anns a' mhuir. Thòisich an iomairt leis na maoir-chladaich, anns an robh heileacoptair, bàta agus sgiobannan air tìr an sàs, mu 6:00f Oidhche Mhàirt. Chaidh an iomairt a chur dheth nuair a chaidh an duine leis a bheil an carbad a lorg slàn, sàbhailte. Bha an Land Rover air bristeadh sìos air an tràigh agus chaidh an dràibhear a dh'fhaighinn taic. Chaidh an carbad an uair sin a thoirt a-mach air an làn. Tha dùil gum bi an neach leis a bheil an Land Rover ga thogail uaireigin Diciadain.